How to tell when rhubarb is ripe is as easy as walking out to the plant. To be honest, rhubarb is “ripe” all spring and summer. But for the health of the plant, there are certain times that you should make your rhubarb harvest. The best time when to harvest rhubarb is when the stalks of the leaves reach at least 10 inches long. This will ensure that the plant has established itself well enough for the year to be able to tolerate being harvested. You can take some of the rhubarb stalks earlier than this, but limit your rhubarb harvest to just a few stalks so that you do not kill the plant. Knowing when to harvest rhubarb also means knowing when the season is over. While technically, you can keep harvesting rhubarb until fall, keep in mind that your rhubarb plant needs to store energy for the winter. 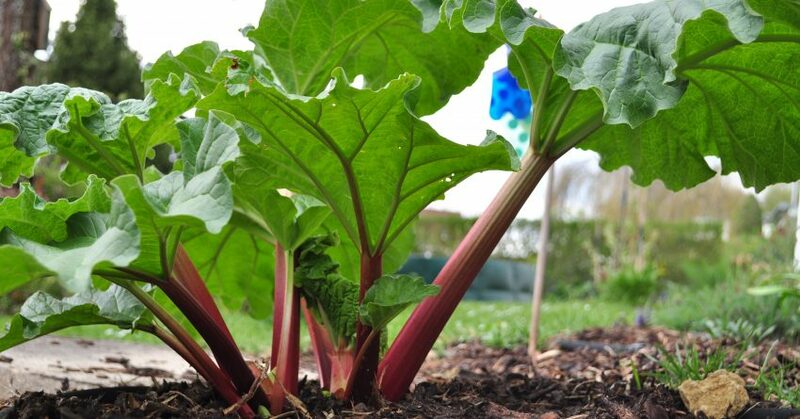 Significantly slow or stop your rhubarb harvest in late June or early July so that your rhubarb plant can build up energy stores to make it through the winter. Again, it can be picked until the frost, but do so sparingly or you risk killing the plant. Also, if your rhubarb is newly planted, you will want to wait two years before taking a full rhubarb harvest from the plant. This will ensure the plant is sufficiently established. Harvesting rhubarb isn’t difficult either. There are two ways how to harvest rhubarb. One is to use a sharp knife or shears to cut off stalks that are at least 10 inches or longer. The second is to gently pull the stalk while gently leaning it to one side until the stalk breaks off from the plant. Never harvest all the stalks off your rhubarb plant. After you cut the stalks from the plant, cut the leaves from the stalk and throw them in the compost bin. The leaves of the rhubarb plant are poisonous and should never be eaten. That is all there is to harvesting rhubarb. Now that you know when and how to harvest rhubarb, you can enjoy these tasty stalks in a wide variety of recipes.